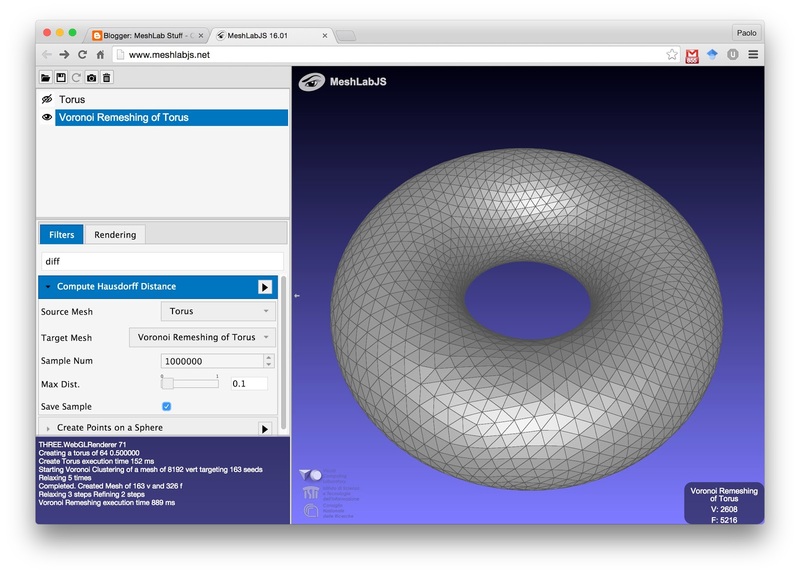 We are proud to present HexaLab.net our new free online tool for inspecting hex meshes. HexaLab is a WebGL online tool for real time visualization, exploration and assessment of hexahedral meshes that runs directly in your web browser. This visualization tool targets both users and scholars who employ hexmeshes for Finite Element Analysis, can readily check mesh quality and assess its usability for simulations. You can use HexaLab to perform a detailed analysis of the mesh structure, isolating weak points and generate high quality images. To this end, we support a wide variety of visualization and volume inspection tools. 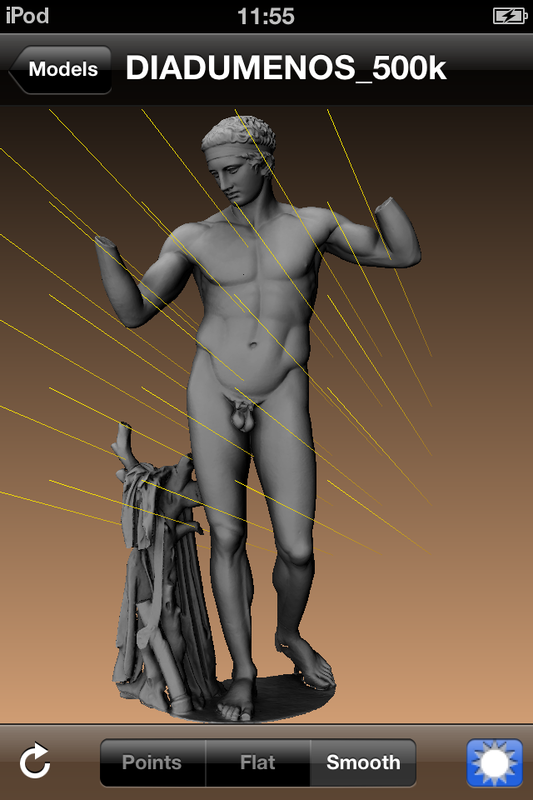 The system also offers immediate access to a repository containing all the publicly available meshes produced with the most recent techniques for hex mesh generation. The system supports hexahedral models in the popular .mesh and .vtk ASCII formats. So follow the link and just drop a mesh on that page, and, please, note that meshes are NOT uploaded anywhere. No 3D data will leave your browser and everything will stay local. Beside classical slicing (pictured above) in HexaLab there are many visualization techniques are available like for example we have a minecraft-like interactive digging and undigging of individual cells, that allows to pick exactly what cell you want to hide/reveal. "HexaLab.net: an online viewer for hexahedral meshes"
Obviously being a totally client based, run-in-browser application it is sufficient to open its web page to get the latest version. :). For a mesh processing system that runs inside your browser a new version is just the deploy of the html+js code on the server. Now a very simple tutorial of what you can do with MeshLabJS v16.01: Remeshing, Comparing two meshes and showing the results. Press CTRL+f (or ⌘+f on OSX) to jump to the find box and type 'torus'. While you type the long list of available filters will reduce to only the ones matching with the typed text (in this case just one). 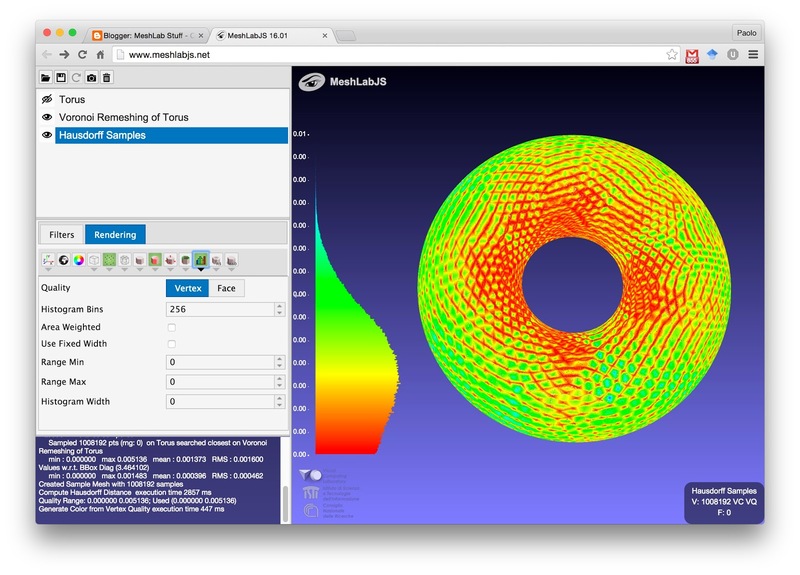 Click on the 'Create Torus' filter box and it will open to reveal the parameters. Just increase the 'Subdivision' parameter to 64 and press the '▶︎' (apply filter) button and you should see a torus appear on the right. Click on the Rendering tab and you access to all the different rendering modes. Click on the wireframe icon to enable, for the current layer, the display of the edges of the mesh. In the space below you should see the parameters of the wireframe rendering (color, thickness etc). done in the geodesic metric. The result is a base mesh that is refined and adapted over the original mesh. Enable wireframe for this mesh too and switch between the two layers to see the difference in meshing. You will notice also that there is another layer 'Haudorff Samples': a 1M point cloud with all the samples computed. For all these samples also the computed distance is stored as a scalar value, called for lazy traditional reasons, quality. Lets color this point cloud according it with the distance computed. CTRL+f /⌘+f and type 'quality' , in the filter list should appear 'Generate Color from Vertex Quality'; apply it to the Hausdorff Samples layer, switch to the rendering tab and access to the parameter of the point rendering (just click on the small down arrow ▾ below the point rendering icon): Choose 'Per Vertex' as 'Color Source' and 'Flat' as 'Shading'. 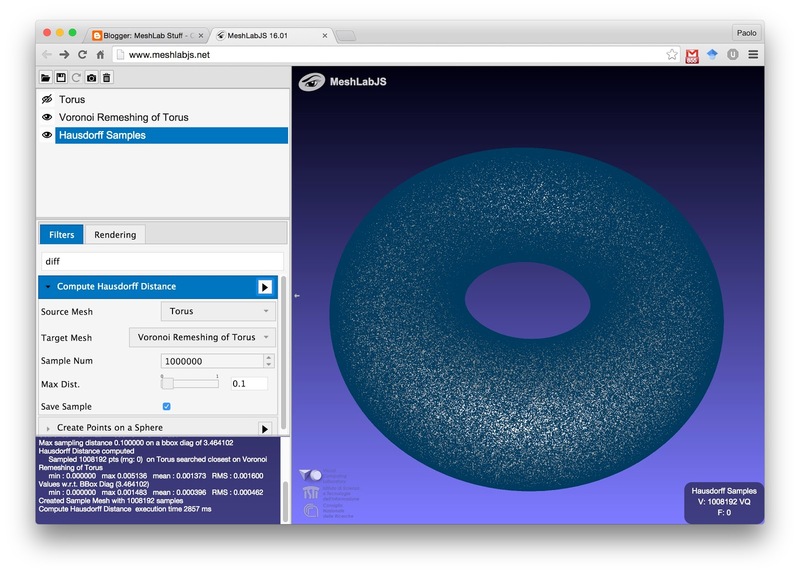 Now you have your nicely colored samples showing the difference between the original torus and the remeshed one. Finally click on the histogram icon to get some insight on the distribution of the error and a more precise meaning of the color mapping used. 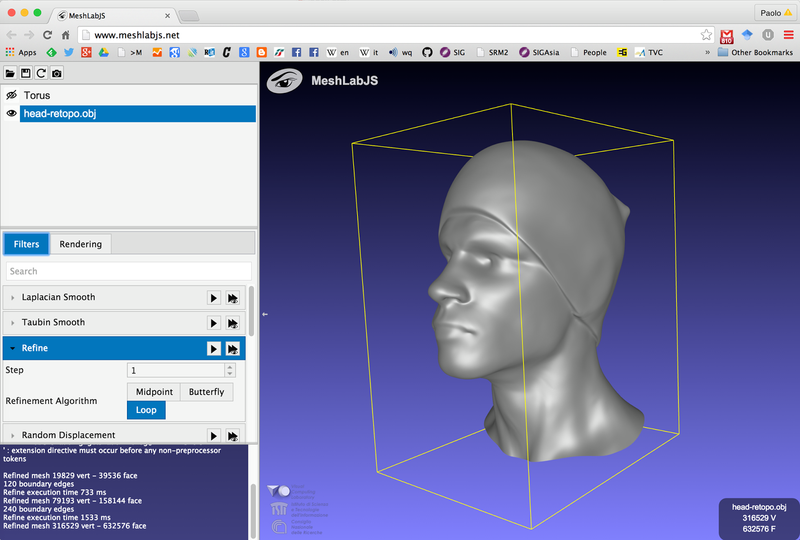 We are proud to present the first beta, experimental, buggy, incomplete version of MeshLabJS, the client-side, run-in-browser port of MeshLab. Yes, a version of MeshLab that runs directly inside the browser. It is a bit more than an experiment, there are only a few tens of filters (more to come! ), and no fancy tools, but some classics like the renowned quadric simplifier and radiance scaling rendering mode, are available. As usual everything is opensource, this time on github. If you like it star it on github and if you need some specific meshlab filter, just ask for it on the github issue page. MeshLab for iOS is available on the App Store! If you liked MeshLab and you have an iPad or an iPhone, you cannot miss this: an intuitive, cool 3D viewer to show your models. It is able to sustain the interactive browsing of detailed models (usable up to 2M triangles). Perfect for boldly show hi quality 3D scanned stuff to non-technical guys. Soon to be released. More info can be found both on MeshPad official web page or on the facebook MeshPad page. The viewer is well integrated in iOs, so it is automatically started whenever you encounter a 3D model in a recognized format (currently just ply stl obj off). It works with models on the web (see the second video) or with other cloud storage services like DropBox. So for example it is easy to put a bunch of model on your dropbox account, to boldly show off them just when you need on your iPad. Stay tuned for the official release of the app! This blog has been quite lazy recently. But now great news! We are proud to announce the birth of a dedicated YouTube channel for MeshLab tutorials. We will upload some new tutorials in the next days. The first one is already online, and it's a basic one about navigation. Stay in touch for news, and if you want to collaborate, you are welcome! At VAST 2010 the 11th International Symposium on Virtual Reality, Archaeology and Cultural Heritage. (Louvre, Paris, 21-24 Sept. 2010) there will be a full day tutorial of MeshLab. It will be held by Marco Callieri and Guido Ranzuglia and will cover almost everything of MeshLab, from basic navigation hint to advanced remeshing, measuring and processing tasks. Obviously with a bit of Cultural Heritage pepper here and there. People interested in a simple but powerful opensource tool for mesh processing. People who need to visualize, edit and convert 3D models. People who need small editing, batch process and mesh cleaning. People trying to integrate/replace an existing mesh processing pipeline. People interested in advanced, custom measuring/processing of 3D models, exploiting state-of-the-art algorithms. Participants will be given the latest build of the tool plus some test dataset to experiment with the presented features. Bring your own laptop!